Would you be interested in seeing that? Well surprise - that movie exists and is called Paddington! But none of the other bears are talking about it! I haven't even heard a peep from Schlop about it. My theory is that it is being discriminated against because it stars a BROWN bear. I bet if Paddington was pink it would be a different story. Well, I personally am very excited to see it! 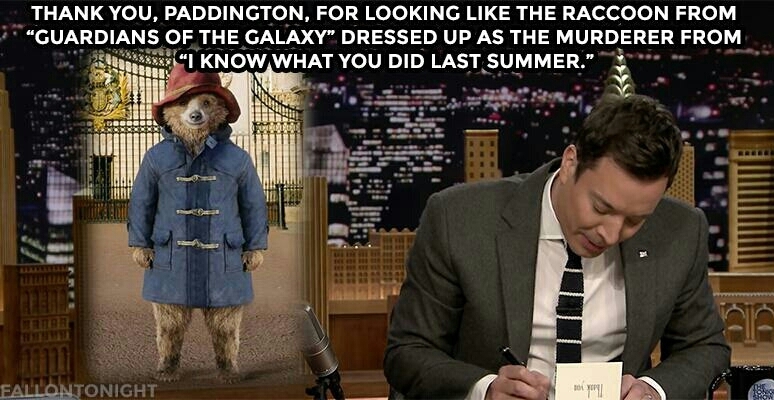 Jimmy Fallon did a piece about Paddington! Do you think Paddington could beat up Rocket Raccoon? Posted: Sat May 16, 2015 6:01 pm Post subject: Every home needs a bear! It is my new favorite movie. Paddington is my new favorite actor. Paddington really likes marmalade sandwiches and he keeps one in his hat. He also calls pockets sandwich compartments. I think Schlop and Paddington would get along really well! Thanks for all the Paddington updates and for watching it! I agree that it's a great step forward for brown bears in film! Schlop is excited to try marmalade and keeping more snacks in his sandwich compartments. He also hopes one day to visit Darkest Peru. Thanks for keeping us all up on bears-in-movies! It's invaluable research you're providing us! Posted: Fri Jan 12, 2018 7:45 am Post subject: Paddington is back! These are pretty exciting times to be a brown bear in Hollywood! I wonder what kind of sandwich-nanigans Paddington gets up to this time? Also how cool is it that Schlop wished to visit Darkest Peru in 2015, and now Lee will be going to Peru herself - the home of Paddington!! Yeah we can't believe Paddington 2 is doing so well! And that Paddington is from Peru! Lee is very excited to go to Paddington's home and look for other fuzzy bears that might need hugs!